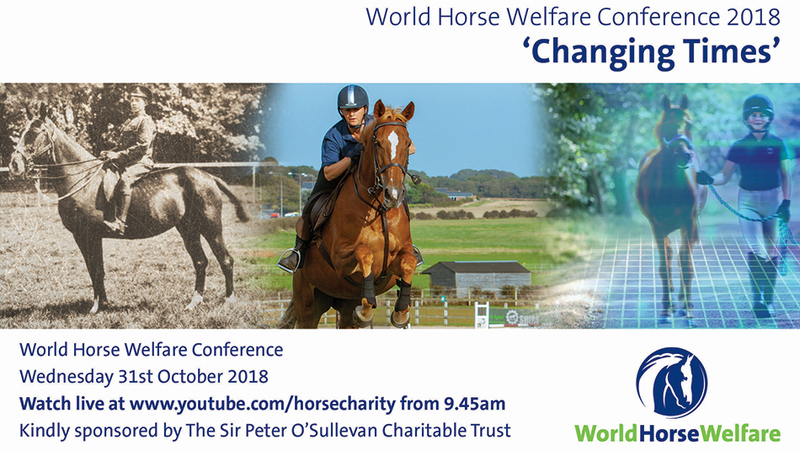 ‘Changing Times’ is the theme for this year’s World Horse Annual Conference which will take place on 31st October at the Royal Geographical Society in London. Speakers from across the international equine sector will cover a wide range of topics from the changing trends in equine training methods to the world behind the phenomenon of Gypsy cobs and the possible impacts of Brexit, to the importance of boosting people’s welfare in order to boost equine welfare. A discussion panel featuring five renowned equine vets will cover a diverse spectrum of issues including the topical debate about rider weight, the unique role of vets in enhancing equine welfare through working with their clients, the challenges presented by hard to reach communities and the developments in understanding of equine behaviour which raise the question of how we define modern horsemanship. Each year the conference is live-streamed on YouTube, but for the first time ever this year, the day’s action will also feature on Facebook Live with added opportunity for interaction and questions from online audiences. World Horse Welfare Chief Executive, Roly Owers, said, “This year’s theme of ‘Changing Times’ is a progression from the past couple of years where we have focused on the world’s Invisible Horses where we wanted to consider the ever-developing debate around the shifting ways in which we manage, treat, understand, care for, protect and perceive the millions of equines undertaking thousands of different roles around the world – and how the changing world around us might impact their welfare. “We are delighted to be joined by such an interesting and eclectic mixture of speakers and panellists who all bring unique expertise, experience and knowledge to the discussions of the day. Online audiences can submit questions for the conference discussion panel by emailing: [email protected] in advance of 5pm on Tuesday 30th October or by using #ChangingTimes on social media.